Please accept my blessings. I'm very glad to inform you that we have reached Malaysia very shortly, that on my arrival there was nice meeting, and then we have come outside the city. Yesterday I was very busy all day. I'm expecting some letter from Russia. So, if such letter comes, you can keep the original letter, but send me a copy. From here the program is I shall go to Sydney and then to Calcutta. So, I asked Tamala to let me know when they want me there. Please accept my blessings. You'll be glad to know that I have come to Malaysia. On Monday night there was a good meeting upon my arrival, and then yesterday I was all day busy in attending three or four meetings. All of them were very big meetings, and this place appears to be very prospective for our preaching work. People are inclined to give us land and a house. Two or three such offers are already in view. So, I'll try to open a branch immediately, either in Kuala Lumpur or Ipoh or Teluk Anson. In Teluk Anson one retired principal of college has offered a house which can be used as temple, already started very big. It is understood that the property is about fifty to sixty thousand dollars. So, things are going on nicely, and I shall be glad to hear from you about how things are going on there. Another point is that from here I shall be going to Sydney, and then from there I shall be going to Calcutta. So, when you expect me there you can write me immediately. I hope this will meet you in good health. Offer my blessings to all others. Please accept my blessings. I am in due receipt of your letter dated April 23 and have noted the contents. I am very glad to know that one new brahmacarini has donated $15,000 and a new car. My thanks to her and she will be initiated as soon as you recommend. So far as distributing the fifteen thousand dollars, I would advise you to send this money to ISKCON PRESS for printing Bhagavad-gita As It Is enlarged edition. They require about $20,000 out of which I have asked Karandhara Prabhu to send them $5,000 from the Book Fund. Similarly, if Lyndan Prabhu can contribute $15,000 then the present problem of printing this book is solved. So if you can kindly let me know your decision to Calcutta address, 3 Albert Road, Calcutta-17. Regarding the new car, I think we require some new cars in India. So if it is possible, the car may be dispatched to India. We have already applied to the Import Department Govt. of India and are expecting a reply soon. So if it is possible send the car to India. So far as your wife is concerned you must be very careful. They are previously two miscarriages, so it is to be understood that she is diseased. A medical practitioner or gynecologist should be consulted in this connection. I shall be very soon coming to USA. After finishing this Australian and Far East business I shall return to Calcutta and probably I shall have to go to Russia. If not I shall be going to London, and from London to U.S.A. This is our present program. I hope this will meet you in good health and thank you once more for your letter. One thing I don't see is your letter heading. Formerly there was a letter heading. You should always use stationery letter heading. That is required. Please accept my blessings. I am in due receipt of your letter dated 21st April, 1971 as well as the photos of the altar and your fine looking Vaisnava son, sent by separate post. If he grows more teeth you will have to supply him more prasadam. That's nice. And he is such a fortunate child. From the very beginning he is having association with devotees, when he was 6 months old he chose Bhagavatam. So take care of him nicely and raise him a Krishna Conscious child and be blessed with your good husband and child and Lord Jagannatha, and be full of transcendental bliss. So far as taking care of the Deities and your family simultaneously, you have to do both mutually, but the main importance is Deity worship. Just like a busy housewife always busy in household affairs, yet still she is engaged in dressing herself nicely, combing her hair, etc. So both things go together. Yes, at least once daily the Deity's clothes must be changed, in the morning. If the Deities are small, as they appear to be from the photograph, then they can be laid down in a bed at night. And they can be given nightgowns to wear before taking rest. That is nice. If there is time and facility then these things can be implemented. So far as bathing is concerned, it requires two hands and one tongue. In your left hand be ringing a bell and simultaneously with your right hand pour water. Chant Hare Krishna, Cintamani, Govinda Jaya Jaya, etc., like that. So far as touching the Deity, this is possible only in a big temple with big Deities, not in a small temple. In big temples like Jagannatha Puri the devotees circumambulate and sometimes touch the Lotus Feet of the Lord, but in a small temple that is not possible. If you need help in caring for Tulsi devi, you can write Govinda Dasi in Hawaii for instruction. Deity worship can be learned at not less than ten years by children. Before that they can assist. They can learn how to bow down, how to dance and chant, how to make garlands, clean arati utensils, etc. In this way they can be engaged. These are also different parts of Deity worship. Regarding Satyaloka, one is in the material world and one is in the spiritual world. The spiritual Satyaloka is eternal; the material Satyaloka is not, although it is so-called. Satyaloka is another name for Vaikuntha. Hoping this will meet you in good health and jolly in Krishna's service. P.S. Today going to Malaysia & then to Sydney. Please accept my blessings. I am in due receipt of your letter undated and have noted the contents. I am so glad to hear that you are now becoming serious about engaging in devotional service. Maya is always there like a shadow, presenting reasons for refraining from devotional service but if we simply keep ourselves engaged in Krsna Consciousness, then Maya cannot touch. We become strong in Krsna's service by following the regulative principles and chanting 16 rounds of beads daily. If we do so then everything will be all right. If we neglect chanting 16 rounds then all these irregularities will spring up. I am glad to note that you would like to see one center opened in Minneapolis. Minneapolis is a large city and certainly a temple should be started there soon. 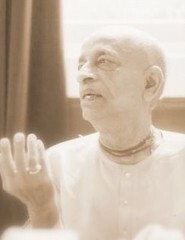 That particular area of the country is under the supervision of Bhagavan dasa Prabhu, Detroit center. If you will correspond with him there in this connection, then I am sure that arrangements can be made for starting one temple in Minneapolis in the very near future. Please accept my blessings. I beg to acknowledge receipt of your letter dated 20th April, 1971 with enclosed clippings as well as your check for $15.00 for my maintenance fund. Thank you very much. Cleansing oneself as well as teaching others to be clean; these two things must be there simultaneously. None of us have perfect desires but we are trying to be perfect and teach others to be perfect as far as possible. They cannot be separated but must go together as parallel lines. Siksa and diksa. Siksa means learning. diksa, or initiation, means the beginning of spiritual realization. So every disciple must make his own spiritual progress positively and help others to do so. You can correspond with the inmates of the prison, but why become involved with the prisoner's rights council? That is not our business, so you should withdraw immediately. Prisoners are dependent on the government. So you should not interfere; it will only complicate things. Also, there is no need of studying Manu. Don't divert your attention in that way. We have got so many books. Those you should study. You may write of our principles to the U.S. Attorney General. Of that I have no objection. Your newspaper and magazine clippings are very nice. They arrived on a day when our life members were meeting and they were appreciated by all. Your ideas for new dramas sound nice, so you can put them into action. And Princeton sounds like an ideal place for our temple, so why not open it immediately? So far as the Finnish film student arranging for engagements, etc. in Helsinki, you may inform her that by the end of June I may very well be in London, so she can contact me there. And all your parents are becoming members. That is very encouraging. That means that they are appreciating their sons' career as spiritual students. Please offer my blessings to the other boys and girls there. Hoping this will meet you in good health. Please accept my blessings. I am in due receipt of your letters dated 26th April, 1971 and have noted the contents. Regarding Vrindaban, perhaps by now you have seen the place. Presently Mahantaji wants to transfer the property to us and wants to go there to Vrindaban on the 8th or the 15th May. So now you can decide when to go there so that he can transfer the property to us and at the same time have Sankirtana, preferably for two or three days. So decide amongst yourselves which of the two days is more convenient and write Mahantaji. His address is as follows: Mahanta Dhinabandhudas; Char Samprada temple; Panchavati; Nasik. When the date is fixed up, you can write both Hamsaduta and Madhudvisa so that some men can come and join you there in Vrindaban. Perhaps you know that Hamsaduta is now in Ahmedabad. His address is as follows: c/o Chimanlal M. Soni; Manekchawk Sankdhishere; Kehjdapol Vithal Niwas; Ahmedabad-1, Gujarat. Probably I will not be able to join you since I am going to Kuala Lumpur, Malaysia and then on to Sydney Australia, and will be starting Monday morning. Please accept my blessings. Yesterday night I received one telephonic call from you. I talked for a few seconds and then you stopped, so I could not understand why you called me. Anyway I think things are going on nicely there. I am still in Bombay and am supposed to go to Kuala Lumpur, Malaysia next Monday. I was supposed to go today but did not because my new passport was misdelivered by the post office. So I am trying to reserve my seat and probably will be going on Monday. I think you have deposited the $5000 installment to my account as was previously informed. If so, please let me know. I shall issue a check to Advaita Prabhu, Iskcon Press. He wants $19,000 for printing Bhagavad-gita As It Is in large edition. So if you have not as yet deposited the money in the bank, then directly give it to Iskcon Press and instead of sending money to Dai Nippon, Bhaktivedanta Book Fund, for the time being go on sending all money to Iskcon Press for printing Bhagavad gita As It Is. When it is printed, say about 2000 copies should be sent to India and the balance should be distributed by you to USA and Europe. Henceforward the books and magazines should be distributed properly and money collected and spent for again reprinting the books. If Iskcon Press can print our books nicely, we have no business with going to Dai Nippon. I think because they have moved to a better place, the press work will go on nicely. This day the whole day has been to me an anxious time because I have heard very bad news from Pakistan. In a local paper it is published that four of our Hare Krishna Movement Missionaries were killed in Dacca by the Pakistani soldiers. I am very much anxious to know about Brahmananda. I had advised Brahmananda not to go to Pakistan after the civil war began there but I am afraid that he was very daring and might have gone against my instruction. So I am very very much anxious to know about Brahmananda. The whole day has been full of anxiety and still it is going on. So if possible, inquire and let me know by telegram. Re: My newly formed HSS a/c no. 14876, opened 20-3-71. In reference to your letter no. 20/149 dated 21st April, 1971, I beg to inform you that generally I visit my branches in Bombay, Calcutta, Gorakhpur and Delhi and sometimes I go outside also. If you will kindly give me a general letter of introduction so that wherever I go I can show the local manager that letter and he will transfer my money without any charges. That will be convenient for both you and me. I thank you very much for your giving this facility so that there will be no inconvenience for transferring my money by mail. From the passbook from your Ballyganj Branch, Calcutta, it appears that they have credited Rs. 14,249.04 to my account, but in my passbook for my account 14538 with you you have credited the amount transferred as Rs. 14,239.31 only. There is a difference of Rs. 9.73. Please credit this amount to my account and explain why the amount credited was less. I am not prepared to pay for your interbranch transfers. That is not the system as it is already agreed by you in your letter dated 2nd March, 1971, No. 20/84.